Manalapan and Afonso De Sousa renew rivalry in the Carlingford Stakes, the feature event on Dundalk's eight-race card. Just half a length separated the pair when second and third respectively in the Group Three Diamond Stakes over this course and distance a fortnight ago and they could fight out this Listed event. Irish Lincolnshire winner Sweet Lightning has winning form on Polytrack in England and is very interesting on his Dundalk debut. There is a good prize up for grabs in the Irish Stallion Farms European Breeders Fund Fillies Handicap, a race dominated by Ger Lyons and Mick Halford in recent years. The latter has won two of the last three runnings and this time relies on Lily Of Kenmare, who ran a good race off the same mark at Roscommon last month and has a course win to her name. Queen Of The Sand and Angela's Dream form a strong hand for Lyons, who collected the prize in 2008 and 2009. Lyons also fires two arrows at the Crowne Plaza Race & Stay Package Handicap, with Toccata Blue expected to be better supported than Lightnin Hopkins. Emmet McNamara's mount has been knocking on the door and can serve it up to Super Sling, an Edward Lynam inmate who appears feasibly treated off an opening mark of 78 following a pleasing course maiden success. All eyes will be on Masai in the Irish Stallion Farms European Breeders Fund (C & G) Maiden, as Aidan O'Brien's colt bids to bounce back from a disappointing effort in the mud at Listowel. 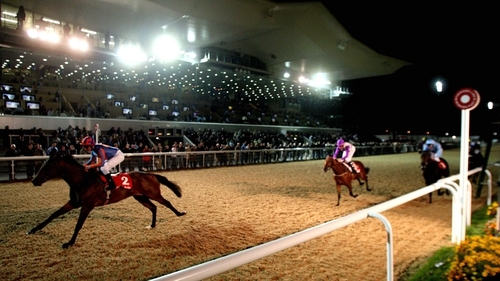 The action gets under way at 5.40 with the Christmas Party Packages At Dundalk Stadium Handicap, in which Almadaa bids for a double after landing the corresponding race 12 months ago off a 12lb lower mark, while Secret Seven tries to continue her progression in the Crowne Plaza Leading Jockey & Trainer Championship Handicap (Div 2).